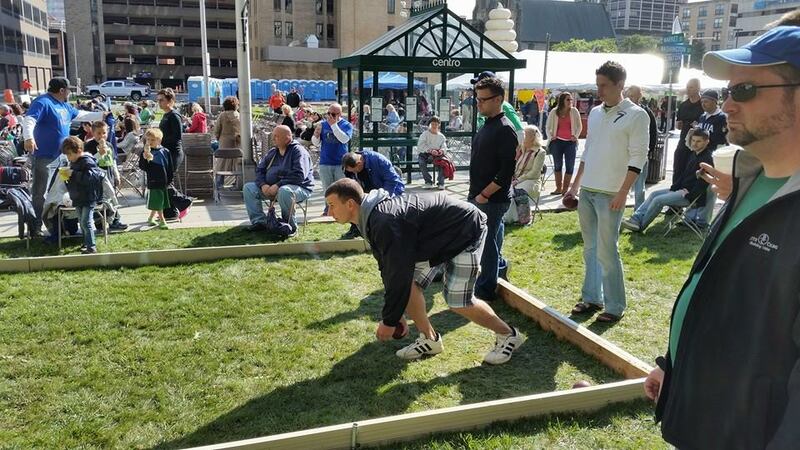 The city of Syracuse holds a large 4 on 4 bocce tournament on the lawn in front of City Hall, every year during its Italian Fest. This tournament has been going on for decades, but for the last seven years it has been a way for Turbo Bocce to showcase just how much better we are than everybody else. Last year we took home all the money by winning first, second, and third place in the tournament. This year would be more difficult. The rain did not stop the bocce! The weather was ominous (50 degrees and raining) but not nearly as ominous as the draw which pitted four Turbo Bocce teams against each other in the first round, including last years champions against last year’s runner ups. It seemed like a shame that one of the two best teams from the previous year would have their tournament ripped from them in the very first game, but that’s what happens when all the Turbo Bocce teams register right at the 9am deadline. George Chirstou, Phil Martino, Andy Ingalls, and Anson Zeppetello (last year’s champs with Anson playing in place of Joe Mead), managed to beat Jim Whipple, John Bowman, Robb Jones, and Monica Angelosanto (last year’s runner’s up with Monica playing in place of Chris Chaffee). After George, Phil, Andy, and Anson knocked out last year’s runners up. 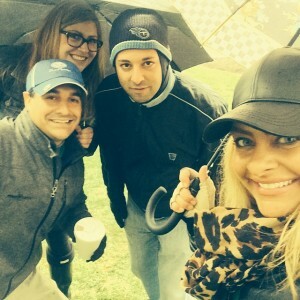 My team, Greg Griffo, Oscar Ordonio, Gina Paduana, and Amanda Fuller knocked out the winner’s from two years ago. Also a Turbo Bocce team (of course), Scott Rau, Bill LaBrake, Bernard LeVine, and Scott Mead. Things pretty much went this way, with Turbo Bocce teams knocking each other out, and some of the other teams looking unusually strong as well, until the final eight. 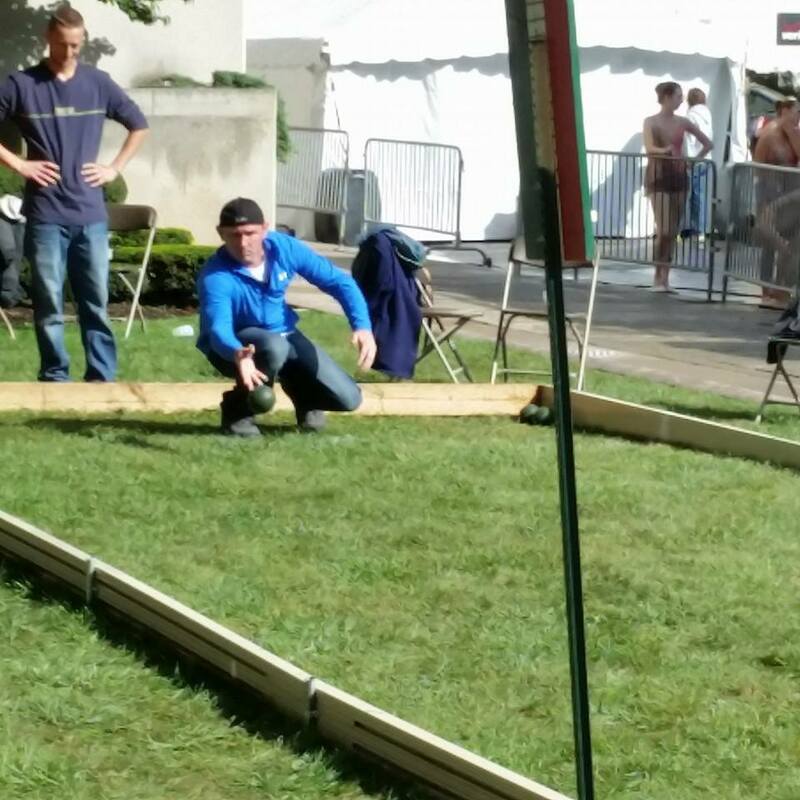 Only two Turbo Bocce teams remained undefeated, and, of course, they had to play each other. 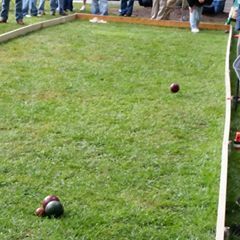 Rob Mead, Tim Maynard, Colin Donahoe, and Mike Aylesworth were playing great bocce and beating teams convincingly when they ran into George, Phil, Andy, and Anson. It was a close game but eventually, last year’s champs won, making them Turbo Bocce’s only hope of taking home its 7th straight Italian Fest title. 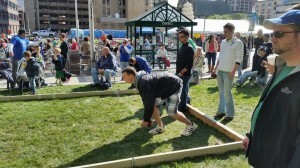 The last two undefeated Turbo Bocce teams playing each other. They next played a team of four guys who wore identical gray shirts with Italian flags on it. While those guys looked like a professional team, they did not play like one. It was their first time playing on Italian Fest’s infamous court #3 which has a big hill in the middle of it that the rookies did not know how to deal with. George, Phil, Andy, and Anson won 10-1, and were upset they gave up the one point. This put them in the championship game, against a team that was playing good bocce, but would need to beat them twice to win. This team won the coin toss and got first throw, which they followed up with an ace. The first three pallino’s they threw were all followed by aces, and a couple other points as well to give them a 5-0 lead in the blink of an eye. It was up to Andy and Anson to stem the tide, and they did, in a BIG way. The biggest way possible, in fact – with a four point round. In a game up to 10 which is not “win by 2” four point rounds are huge game-changers, and this was exactly that. Even with all those aces the other team now only had a one point edge, which George and Phil would quickly took care of in the next round. George, Phil, Andy, and Anson were now in control of the game, with George and Phil playing particularly well. They got the score to 9-6 in their favor, then handed the pallino to Andy and Anson for the win. After seven of the eight balls were thrown, the opposing team was in for a point with Andy Ingalls having one remaining shot, which he promptly rolled in for the game winner. Andy Ingalls throwing the winner! 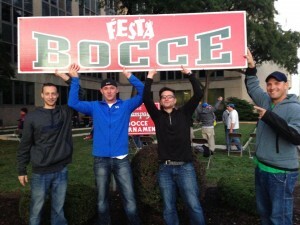 George, Phil, Andy, and Anson won 10-6 and emerged undefeated from a double elimination tournament, for their second straight Italian Fest championship. For Turbo Bocce as a league it was our 7th straight title, and our most difficult in a while, but this was George and Phil’s year all around, and nobody was going to beat them on this day.